2. By comparing corresponding parts across the entire facade:the tympana, the frieze, the apostle and angel figures, or the bases and socles. 3. By clicking on the hightlighted areas of the diagram below. 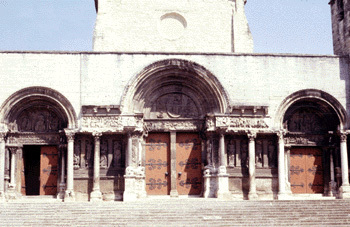 Abbey of Saint-Trophime at Arles. Click here for selected bibliography.